KIKI`s Organic Psyllium Husks Powder is a highly soluble and convenient source of dietary fibre and is also rich in micronutrients. KIKI`s psyllium husks are derived 100% from seed husks of the plantago ovata plant. They have not been genetically engineered, modified or chemically treated. The husks are ground into a fine powder which mixes easily with liquids and is easily digestible. Organic Psyllium Husks Powder is a pleasant and easy way to add valuable bulk to your diet, which is essential for healthy digestion. Add one heaped teaspoon to any drink or smoothie. It is vital that you drink plenty of water when consuming psyllium husks and throughout the day afterwards. 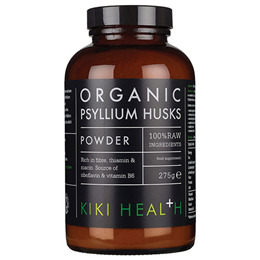 Below are reviews of KIKI Health Organic Psyllium Husks Powder - 275g by bodykind customers. If you have tried this product we'd love to hear what you think so please leave a review. Love this powder! Much better than psyllium husks.